Squirrels on your patio can be quite a nuisance. 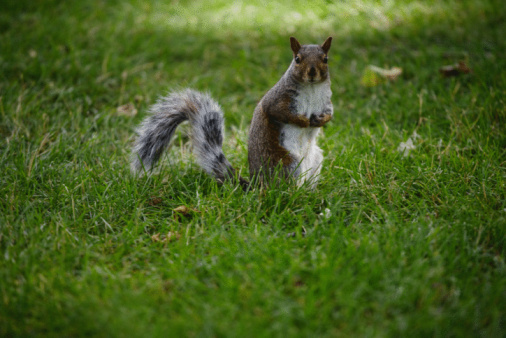 From chewing up wood furniture, to tearing apart cushions, to leaving their acorn shells scattered everywhere, squirrels can make one big mess. There are a few humane ways you can try to get squirrels off your patio. In the best case scenario -- they stop bothering your family -- but still get to live their happy little lives in the woods -- playing in the trees around your property. Squirrels can leave cracked empty shells scattered on your patio. Go to the pound and adopt a dog or cat. Dogs or cats are known to hunt squirrels. Often, once a squirrel sees a dog or cat on the property, they keep their distance. Allow your dog or cat to mark their territory around your patio. Instruct the dog or cat to mark the perimeter. Squirrels will smell the scent of the pet and stay away. Allow the dog or cat to hang out on the porch. The squirrel will see, hear, and feel the presence of the animal, keeping them at bay. Gather the multitude of acorns which have fallen on your patio. 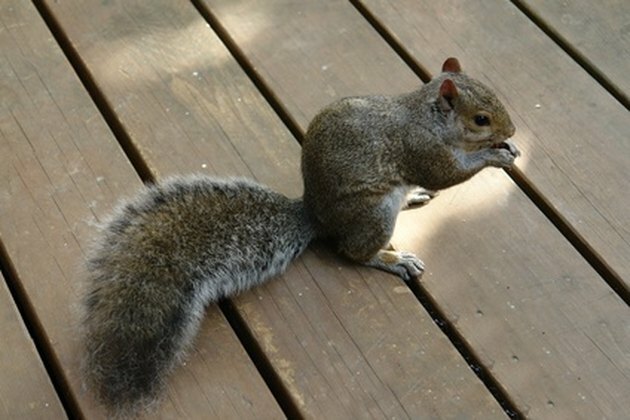 Often, squirrels come onto the patio because they see their food source, acorns, scattered about. Sweep up all of the acorns you can find. Cluster the acorns throughout the yard. Place their food supply in clusters, in desired areas around your yard. Sweep off any additional acorns that fall. Once the clusters have been eaten around the yard, replace them, so that the squirrels have a new food supply. Sprinkle cayenne pepper around the base of your patio furniture. Squirrels are repelled by the spicy scent of cayenne pepper. This is especially effective if they are chewing your furniture. Spread cayenne pepper around the perimeter of the patio too. Treat any other areas, such as bird feeders, or the nooks around cushions, where the squirrels have been problematic.